In this week's Abundance Insider: Self-driving car kits, Microsoft’s anti-cancer mission, and large-scale tidal power farms. What it is: Claire Lomas recently completed the U.K.'s biggest half-marathon at the age of 36 -- despite being paralyzed and 16 weeks pregnant -- thanks to a robotic suit she wore during the race. The powered exoskeleton by ReWalk Robotics was designed with motion sensors located in the feet, hips and upper body, enabling the user to control their movements: for example, the ability for paralyzed patients to lift their own leg. What it is: Scientists out of the University of Bath say early experiments suggest it may one day be possible to make babies without using eggs. They have succeeded in creating healthy baby mice by tricking sperm into believing they were fertilizing normal eggs. The findings, published in Nature Communications, could, in the distant future, mean that the baby-making process no longer requires women. What it is: While social media networks were livestreaming the recent U.S. presidential debate, NBC took it one step further and streamed the debate in VR, thanks to a partnership with Altspace. People could attend by using the AltspaceVR app on the Oculus Rift, HTC Vive or Samsung Gear; the stream was also offered in 2D via Mac and PC. What it is: Microsoft has vowed to "solve the problem of cancer" within a decade by using groundbreaking computer science to crack the code of diseased cells so they can be reprogrammed back to a healthy state. Microsoft has assembled a "small army" of the world's best biologists, programmers and engineers to tackle this problem, opening its first wet laboratory this summer focusing on cancer as a computational problem. What it is: Comma.ai, the self-driving car startup helmed by iPhone hacker George Hotz, has unveiled new details about its first commercial product, the newly named Comma One. TechCrunch reports that the $999 aftermarket kit will allow buyers to give their cars semi-autonomous abilities on par with Tesla's Autopilot. What it is: Sandisk has just released images of its SDXC prototype card, which boosts 1 terabyte of memory. That makes it the current biggest SD card on the planet, with 16,384 times more storage than the 64GB SD card Sandisk parent company Western Digital released just 16 years ago. 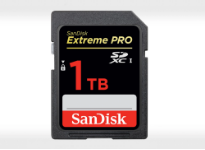 While The Verge rightly points out that this 1 TB SD card will likely be expensive, relatively slow to write/read information, and still susceptible to data corruption or loss, we know that it's only a matter of time before its price-performance ratio improves. What it is: Four Thieves Vinegar, a medical hacking collective, has created an open-source, DIY version of the EpiPen emergency allergy medicine and auto-injector that costs just $30 in off-the-shelf materials. They designed the device in response to parent company Mylan's controversial EpiPen pricing strategy. "The pharmaceutical company Mylan, which is the only manufacturer of the device, was recently shown to have raised the prices of a single device from $57 to $318 -- that's a 461 percent increase -- since acquiring rights to it in 2007," reports MIT Technology Review. What it is: The latest electric bus from Proterra, the Catalyst E2, has just logged some impressive statistics at the Michelin Laurens Proving Grounds in South Carolina: 600 miles traveled on a single charge, and a reported nominal range between 194 and 350 miles on a single charge when simulating realistic driving conditions. This means that, for the first time, an all-electric bus is capable of serving "the full daily mileage needs of nearly every U.S. transit route," as a Proterra press release describes, making it "the first direct replacement for fossil-fueled transit vehicles." What it is: Scotland has unveiled its first of four turbines for Phase I of the MeyGen tidal stream project – the world's first large-scale tidal energy farm – designed to generate electricity from Scotland's northern tides. The 1.5-megawatt turbines, developed by Atlantis Resources, each weigh 220 tons and stand 49 feet tall. Project organizers ultimately plan to install 269 turbines with a total capacity of 398 MW, which would be enough energy to power 175,000 homes.